The teddy with the magical eyes. 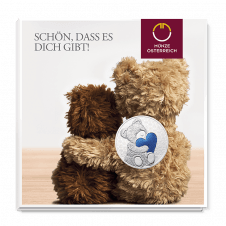 The silver version of our Teddy Bear medal also has a brand new feature: the cute bear’s eyes are two real diamonds. The big heart held by the bear comes in red or blue. 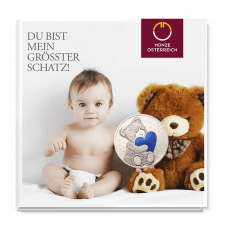 You can also make the silver Teddy Bear medal a truly personal gift by having it engraved with a special dedication (15 characters per line; maximum 3 lines). The teddy with the magical eyes. Our Teddy Bear medals in copper/nickel/zinc now have a brand new feature: the bear’s eyes are made of Zirconia! The silver version eyes are two real diamonds! And the big heart held by the cute bear now comes in two colours – classic red and cool blue. The Teddy Bear medal comes in three different blister packs: one with the greeting “So glad you are here”; one with “Thanks for being my friend”; and one with “You are my sweetheart”. The Teddy Bear medal comes in three different blister packs: one with the greeting “So glad you are here”; one with “Thanks for being my friend”; and one with “You are my sweetheart”. Our Teddy Bear medals in copper, nickel and Zinc now have a brand new feature: the bear’s eyes are made of Zirconia! And the big heart held by the cute bear now comes in two colours – classic red and cool blue. 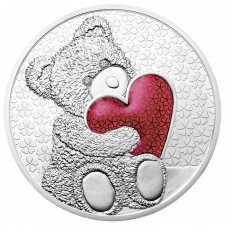 The silver version of our Teddy Bear medal also has a brand new feature: its eyes are two real diamonds! The big heart held by the cute bear now comes in two colours – classic red and cool blue.